The Itty Bitty Kitty Committee: If You Need Me, I'll Be In Here. If You Need Me, I'll Be In Here. That is a wonderful hidey-hole, Charlene! Enjoy your down-time as best you can, even though we would love to see kittens...I for one am willing to wait. Angel-face in that last photo! Charlene is gorgeous as always. Just a lot of waiting around for you too Charlene? You aren't getting Kitten Fever are you?? Do you like this shde of blue because it reminds you of Beanie's eye or do you like this shade of blue because it matches Beanie's eyes? 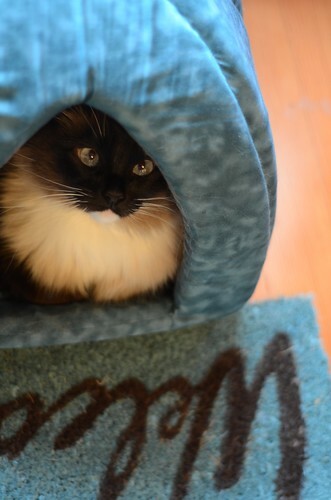 In any case the fort and this hidey hole are FAB! Well before Bean, I've loved that shade of blue and have always had a lot of it in the house. I do consider Bean's coloring when selecting accessories for her, but the hidey-hole was a hand-me-down from a friend, so that matching was purely a coincidence. Tsk tsk and there is your special scratchy mat so you don't ruin mom's carpet. You look adorable there Beanie. With those eyes, only blue would do. Let me guess, the top half of her welcome mat says "Kittens". I hope she's not too bored without other felines around. Cozy, cozy kitty. Cozy sweet Bean. She looks perfect with all that blue around her! Such a beautiful girl. WEll, at least it's easy to figure out how she got into this resting spot! I still haven't figured out how she got to the top shelf of the closet. 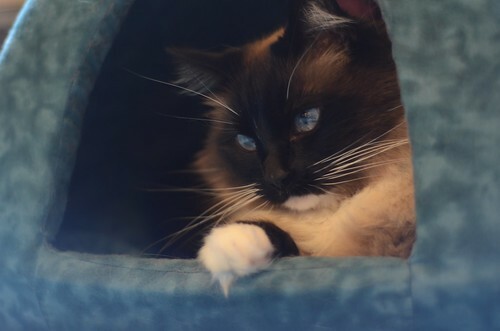 It's becoming obvious that La Bean is choosing locations which match her lovely blue eyes, too! Oh, Miss Bean, you are just lovely! What a perfect napping nook, Bean. Now you just need some tuna sushi and a cool drink. Oh look! it says welcome! Does that mean I can join her for a snuggle?? The Bean has the dearest little face. I think I could pick her out of a line-up of kitties of the same colorway! She's so beautiful--you are really spoiling us with the beautiful Bean pictures, the magnets and the reunion with the dear Dearborns. So much great stuff that I've not even noticed that there are no new kittens. I hope Charlene is enjoying her special alone time with both of you.